The 2017-18 NHL season was the 20th for the Nashville Predators. It was the first time that the Predators won the Presidents' Trophy, finishing the regular season with the most points in the NHL. They qualified for the playoffs by placing first in the Central Division but sadly lost to the Winnipeg Jets in the Second Round (4-3). This was the fourth consecutive season that the Predators have made it to the playoffs. The Predators are back and have their sights set on bringing home a Stanley Cup. Led by a stifling defense, Nashville looks poised to reign atop of the Central Division and put the NHL on notice. Division rivals, the Minnesota Wild and the Chicago Blackhawks will fight to halt the Predators plans. Grab your Nashville Predators tickets and head down to the Bridgestone Arena to lead your team to victory! The First Stanley Cup Finals Appearance - Nashville’s first ever appearance in Stanley Cup Finals will always hold a special place in the history of the franchise. It is the first wild-card and eighth seeded team in the NHL that managed to upset the top-seeded team (Chicago Blackhawks) in their Conference. The Preds progressed to the finals by eliminating teams such as the St Louis Blues and the Anaheim Ducks. Although they lost the Cup to the Pittsburgh Penguins but by being a relatively new side, their resilience and technique against well-established teams deserves much applause. 2016 NHL All-Star Game - On January 31, 2016, the Bridgestone Arena in Nashville hosted what is perhaps the best weekend in the NHL season. The 61st NHL All Star Game introduced a new format in the Music City. The traditional game was replaced by a four team, three-on-three tournament with one team from each division. Four Predators namely Pekka Rinne, Shea Weber, Roman Josi and James Neal competed in the game along with future Predator P.K. Subban. This game marks the city’s first major contribution to the league. To have four Predators play in this game was a huge achievement for the franchise. The weekend brought great revenue to both the city and the NHL which finally recognized Nashville as a real hockey city. Chicago Blackhawks -The Predators-Blackhawk rivalry is as intense in the stands as on the ice. A tendency to invade the other’s arena for away games has been noticed by fans of both the teams. Even though Nashville made a Stanley Cup final appearance, some of Hawk fans continue to deny the viability of Nashville as a hockey market which further fuels the vitriol between the two cities. The two NHL teams have clashed a total of 105 times so far. And with the Hawks claiming victories over the Preds in 55 of these encounters, it is viewed as the number one rival of the Predators. The Preds, however, have what it takes to dominate their biggest rivals. It was a treat for their fans to watch them take down Chicago in four games during the opening round of the Stanley Cup Playoffs last season. Detroit Red Wings -The Predators-Wings rivalry stemmed from the number of auto workers that migrated to Tennessee from Detroit (also known as Motor City). When the two teams were in the Central Division, they would play each other up to eight times in a season. However, that has changed since the realignment as now the Wings and Preds face-off only twice in a season. But whenever the Red Wings come to town, it is still a pretty big deal for the fans of both sides. Nashville Predators may not enjoy a history like some of the older teams in the NHL, but they’ve produced some of the greatest ice hockey players who have led the team to where it is today. David Legwand - Forward David Legwand is the first player to be drafted by the Nashville Predators. He played nearly 1,000 games with the team. With Legwand on the roster, Nashville made seven playoff appearances. The 2006-07 season was his best as he scored 63 points in 78 games with 27 goals. Shea Weber - Defenseman Shea Weber was drafted 49th overall by the Nashville Predators in 2003 and went on to play for the team for eleven seasons. He became the fifth Nashville Predators captain in 2010 and remained with the team until being traded to the Montreal Canadiens. In the 2015-16 season on December 5, Weber scored his first career hat trick against the Detroit Red Wings. This was also the first ever recorded by a Predators’ defenseman. Weber is highly respected and adored by the fans both for his performance on the rink and his off-ice professionalism. There's always fun to be had in the Music City and some of the best shows of the year happen on the ice at the Bridgestone Arena. While the whole building rocks on game night, pay particular attention to Section 303, which one of the loudest fan groups in the league calls home. The NHL preseason and regular season schedule for the Nashville Predators is out. Their preseason kicks off on September 17 with a game against the Florida Panthers. The Nashville team will then be pitted against rivals such as Tampa Bay Lightning and Columbus Blue Jackets. There is lots of thrill and fun in store for you in the upcoming months. So watch out for the Nashville Predators playoff tickets and book them as early as possible. Our process for purchasing cheap Nashville Predators tickets is simple and fast. There are so many online ticketing sites, that it can be hard for customers to find the right place to buy Nashville Predators tickets at the cheapest price. At ScoreBig we think of our customers first and foremost. We offer daily deals for Nashville Predators events, so our customers can get the best seats for the best prices. ScoreBig will always go above and beyond to offer the cheapest Nashville Predators tickets on the market. The Nashville Predators schedule above, displays all available events for 2019 and 2020. Once you find the event that you would like to go to, click the red “Get Tickets” button. It is located on the right-hand side of the event listing, it will take you to an Nashville Predators event ticket page. ScoreBig's event ticket page will display all available Nashville Predators tickets for that event. On the event ticket page to help with your search for the right Nashville Predators tickets, use the filters at the top to select quantity, price range, and more. There is also an interactive seating chart so you can pick where you want to sit. When you are ready to buy a ticket, click on the listing, and you will be directed to ScoreBig's checkout page. Upon completion of the information fields, your order will be processed and your Nashville Predators tickets will be delivered via email, mail, or to your mobile device. What makes ScoreBig’s site stand out from the rest? We are constantly analyzing our competitors to improve our site, service, and prices. ScoreBig.com employees strive to offer the best process and experience to buy cheap Nashville Predators tickets. Our goal is to get you the best seats to Nashville Predators events. We offer daily discounts on our site and for special promotions check out our newsletter. If there are no Nashville Predators events currently available, you can use our search feature at the top of the page to see a list of all popular events going on near you. No matter your price point, we have all the best deals and discounts on Nashville Predators tickets. For more information on prices of Nashville Predators tickets and the schedule for Nashville Predators , check out our listings above. The last thing you want to find out is when the Nashville Predators event you wanted to go to is sold-out. Don’t worry in many cases ScoreBig has affordable tickets to sold out events. We sell tickets from GA all the way to premium seating and parking. Skip the scalpers in the parking lot and get your tickets online from top Nashville Predators ticket brokers. We get you in all events, buy your Nashville Predators tickets here from a brand that many trust and rely on for all their ticketing needs. ScoreBig offers a 100% money-back guarantee. If you have been in search of cheap tickets for Nashville Predators , ScoreBig by far is the best option. That’s why ScoreBig has more loyal customers than any other ticketing site. 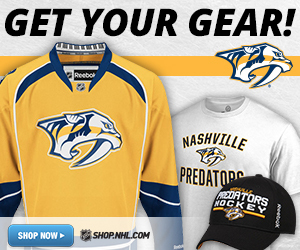 Shop at ScoreBig for safe and secure Nashville Predators event tickets.